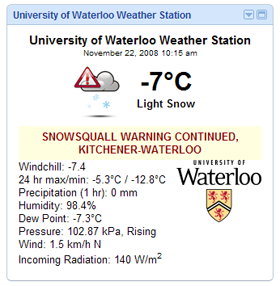 The UW weather station got a mention in Environment Canada's regional weather highlights for 2008. 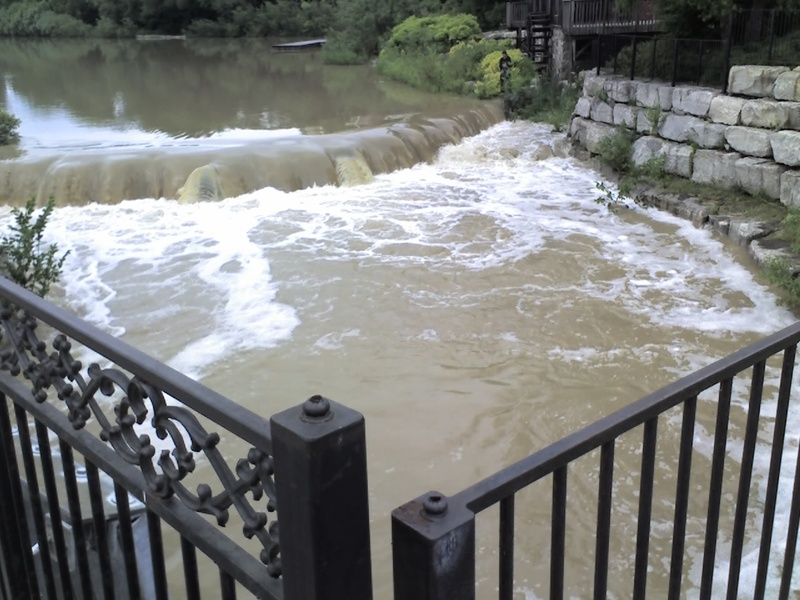 We are mentioned under the "Soaker Storms in Kitchener-Waterloo" story. Could be the wettest December ever! The highest ever December precipitation was 1949 with 139.7 mm. As of 9:30 am on Monday, December 29 we have had 132.5 mm. We are expected to get about 5 cm of snow on Tuesday night, as that usually translates into about 5 mm of precipitation we will probably be very close to the record. A few weeks back I said that it would be very hard for us to move up from third spot on the list of the highest annual precipitation totals in the area. But then we got all this rain. The current highest precipitation we have had in the area was 1186.4 mm in 1985 and the second highest was 1174.9 mm in 1940. 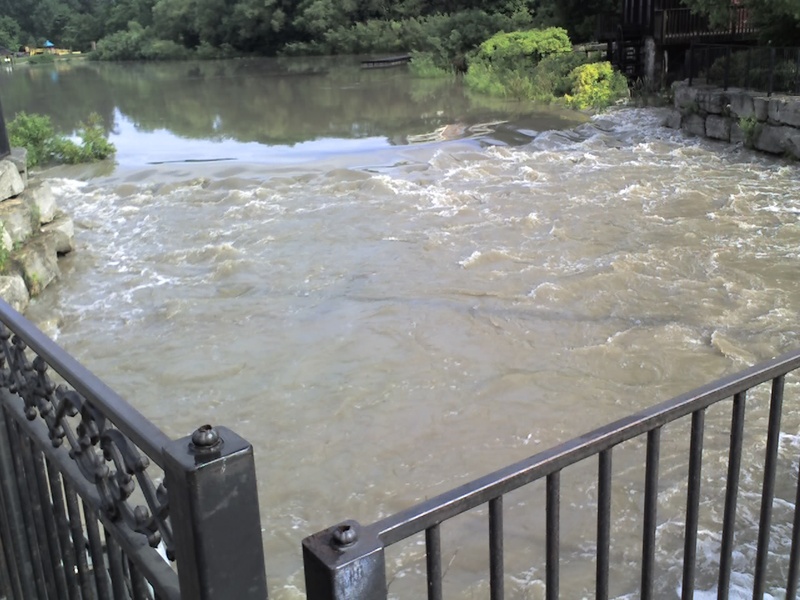 As of 4:00 pm on Saturday, December 27 we have had 1152.2 mm in 2008. 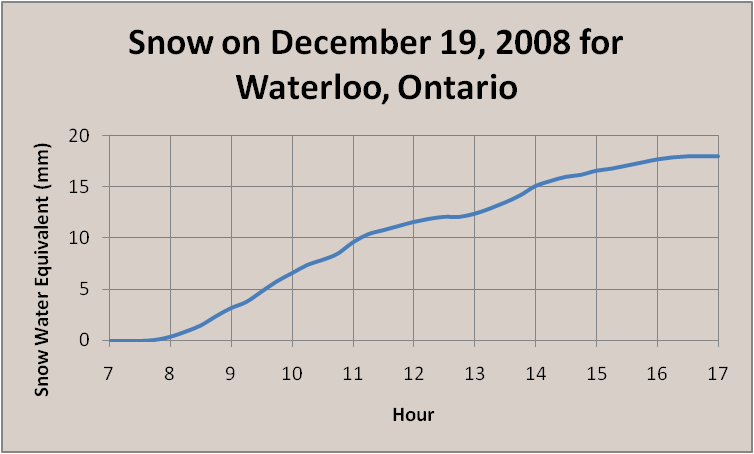 With 96 cm of snow, the fall of 2008 ranks as the third snowiest fall since records in the area began back in 1915 (the two snowiest were 1950 with 114.5 cm and 1951 with 105.5 cm). However what we got as snow we didn't get as rain, so the total precipitation of 250.4 mm puts it just barely above the average range. Looking at the temperature, there were a couple of warmer than average periods during late September and early October. But after reaching 20 °C in early November the temperature was consistently lower than average for the rest of the season. Even though overall it was only 0.7 °C colder than the average, it still ranks as the coldest fall in the 10 year history of the UW weather station. Unofficial "snow-maggeddon" totals for December 19th. This will be final update as the snow stopped around 5 pm. Here is graph showing the intensity of the storm. As you can see from the graph the storm had a very consistent intensity for most of the day, with a bit of break around 1 pm. Listen to my chat about today's storm with Carlos and Gayle from DaveFM. Depending on how much of the forecasted snow we get this Friday, this fall could make it into the top three snowiest fall seasons since record keeping began back in 1915. As of Wednesday morning we have had 75.5 cm of snow this fall. Cold temperatures are a coming. With a cold front coming across southern Ontario today, I thought it might be interesting to watch the contrast in temperatures across the region as the day progresses. I'm going to try and put out a snowfall update for the season each week. Still more than twice last year's amount and the official start to winter is over a week away. With the mixed bag of precipitation we saw on December 9th, the total precipitation for this year passed the 1064.6 mm recorded during 1986. That means 2008 is now officially the third wettest year for this region since records began back in 1915. But it will be a challenge to move up any higher as the second spot is currently held by 1940 with 1174.9 mm and the wettest year was in 1985 when 1186.4 mm was recorded. As we would need another 100 mm in the three remaining weeks of the year to get to the top, we will probably have to happy with third place. It seems that people are interested in how this snow season is comparing to last year's record setting one. Well last year on December 5th our snowfall total was 27.5 cm, while this year we have already had 52 cm. That is almost twice as much as last year, but we still have a long way to go to beat last year's record of 257.5 cm. It isn’t very hard to see when the weather changed this November, after a few days that were close to 20 °C in the first week and a high of 8 °C on the 15th, the temperature went south and never again got above 2.5 °C. The contrast between the two halves of the month can clearly be seen in the temperature graph (see the link below); as well you can see the period near the end of the month when the temperature hovered around 0 for almost 4 days. Overall the month was 0.8 degrees below average, this is a bit warmer than last year’s November when it was 0.9 degrees below average. However, the daily highs were actually colder this year than they were last year, but the daily lows were warmer making the overall average temperature a bit warmer. Another month of above average precipitation with 115.0 mm coming down compared to the average of 82.3 mm. Most of this occurred between the 14th and 16th (48.8 mm), during the transition between the warm and cold parts of the month. A total of 1023.2 mm of precipitation has been recorded so far this year, which is of course well above the average of 835.6 mm. We have now had the 3rd highest precipitation for the first 11 months of any year since records in the area began back in 1915. It will however be difficult to end up with the wettest year on record, to do this we would need 163 mm in December to overtake 1985 and 151 mm to come in second just ahead of 1940. To put this into perspective the highest total precipitation for the month of December was 139.7 mm in 1949. Well no doubt about that one. We got 2 cm last night to make October 29th the first official day with measurable snow at the UW weather station for the 2008-09 snowfall season. Only 256 cm more and we break the all time record! Perhaps the first snow of the season? With snow in the forecast I always get the question about how to tell when we get the first snow of the season at the UW weather station. This question (along with many other) are answered on the Frequently Asked Questions(FAQ) page. Although the official high temperature for Tuesday, October 21st was 8.2°C, that happened at midnight. So the "daytime" high was only around 4°C, which makes it a very cold day. It was also the first time I can remember seeing the Windchill graph appear on the Weather Graphs page since the spring. But we didn't see any of the snow that was predicted by some of the long range forecasts from last week. OK maybe some of the precipitation I saw today looked kind of solid, but I didn't see anything that could be actually be classified as snow. Looks like it will be a fine weekend to enjoy the fall colours. It doesn't look like this Thanksgiving weekend is going to be as nice as last year's when the average temperature was around 27°C and we got to 30°C on the Monday. However, if we get to the mid-twenties it will still be 10 degrees warmer than the average for this time of year and there is no rain in the forecast, so that's not too bad. I don't think there can be any complaints about the Thanksgiving weekend, the average temperature was around 24°C and no rain to be seen. At 5:00 am on the morning of Tuesday, October 7th the temperature when below zero for the first time since the spring, making it the first frost day of the fall. The last time we had a frost day was back on May 1st. This made for 158 frost free days during the summer, which is exactly the average over the last 10 years. There is a forecast low of -1°C for Monday night/Tuesday morning. This would be the first frost of the season. In the 10 years of the UW weather station the first frost day has ranged between October 2nd and October 28th, with the average coming in around the 11th. But no matter if it does actually go below zero at the station, depending on your particular location there is a good chance that you will get frost and you should make appropriate arrangements for your delicate plants. On Thursday, October 2nd the high only reached 10.3°C. This is the coldest daytime high temperature since May 21st. In the 10 year history of the UW weather station, the temperature in September has been the most above the average of any month and this year is no different. In total, 8 of the last 11 Septembers have been above average and the other 3 have been average with none below average (looking back the Environment Canada archive, 1993 was the last time we had a cold September). This year it was 1.6 degrees warmer than the standard average period of 1971-2000. We were on a torrid pace during the first half of the month with 107.6 mm of precipitation by the 15th, however since then we have only had another 8.6 mm. This still puts us far above the average of 87.5 mm, but if we had doubled the first half total it would have been something to see. With 862.9 mm of precipitation at the end of September, this is now the 5th wettest first 9 months of the year since record keeping began back in 1915. Not only sunny each and every day but a 0% chance of precipitation as well. Ironically, it looks like summer weather might finally be here, just in time for school to start. 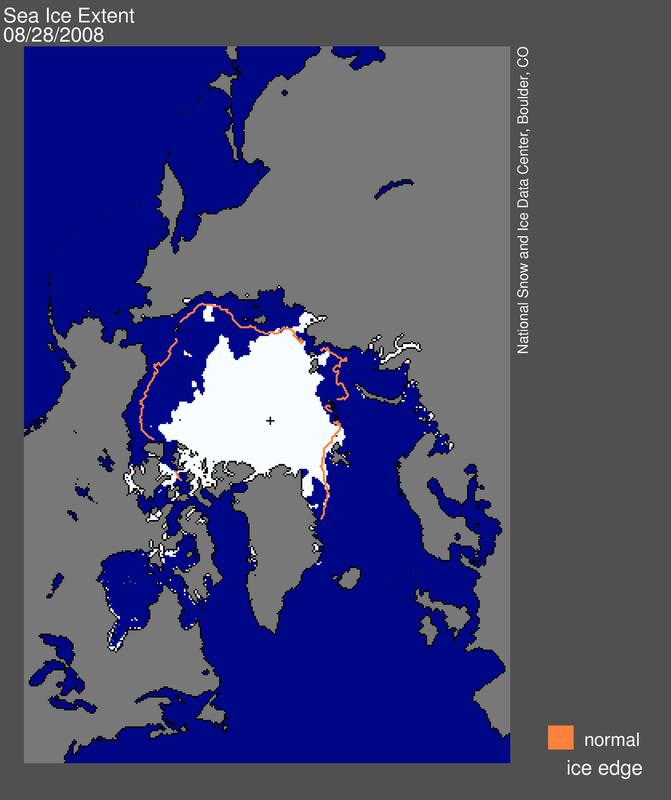 It is still possible that this summer will see even less arctic ice than last year's minimum, but it is going to depend how these next few weeks play out. 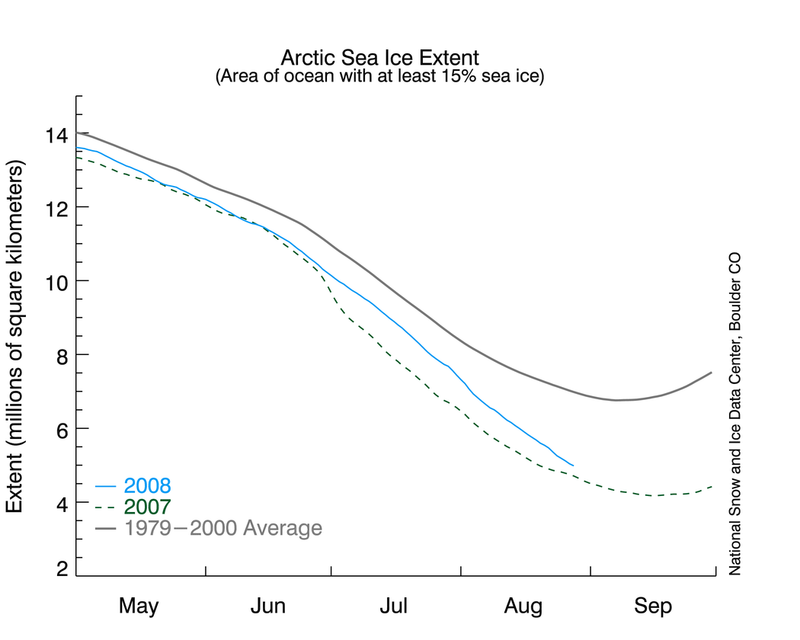 Historically the arctic ice minimum occurs during September. The solid gray line is the historical average ice extent, the dashed green line is last year's, and the solid blue line is for this year. 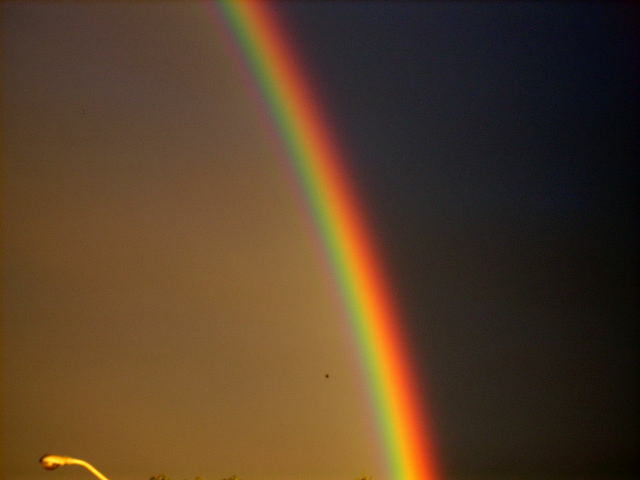 Just looking out my office window and once again I see a rainbow. 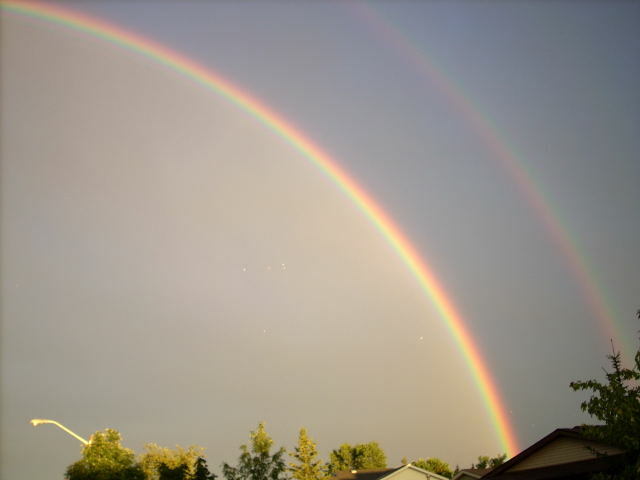 I think the number of days this summer where we have seen both rain and sun has made this the summer of rainbows. 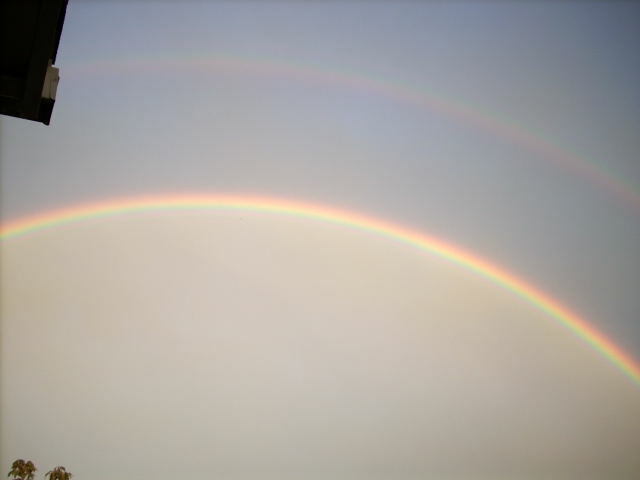 I can't remember ever seeing as many as I have this year, but I don't think I will be able to prove this as "number of rainbows" is not commonly reported at weather stations. On Sunday, August 10th the high temperature was only 18.8°C, making it the lowest daytime high since June 19th. That night (so actually the morning of August 11th) the temperature got down to 10.6°C our coldest temperature since July 5th. On August 9th, 14.4 mm of rain fell between 5:15-5:30 pm. Before last month that would have been the highest 15 minute amount since 2000, but now it is only the highest for a few weeks. We had 2 very significant rainfall events during the month, the first occurred on the morning of July 11th between 3 and 9 am when 78.0 mm of rain fell. This was the highest one day total precipitation in the 10 year history of the weather station and you have to go back to July 7, 1991 to find a higher daily total (82.0 mm). Hardly surprising then that the overall precipitation for the month was the most we have seen at the station for any month (181.0 mm). We have to go back to July of 1991 at the Waterloo-Wellington airport station to find a month that had more (182.6 mm). An intense storm on the 30th put the month into 5th place for the highest July precipitation total since records began in the region in 1915 (number one is 1988 when there was 223.2 mm). The combined June/July precipitation (287.4 mm) was the third highest of all time, here the highest total goes back to 1947 when the combined June/July precipitation was 309.4 mm. 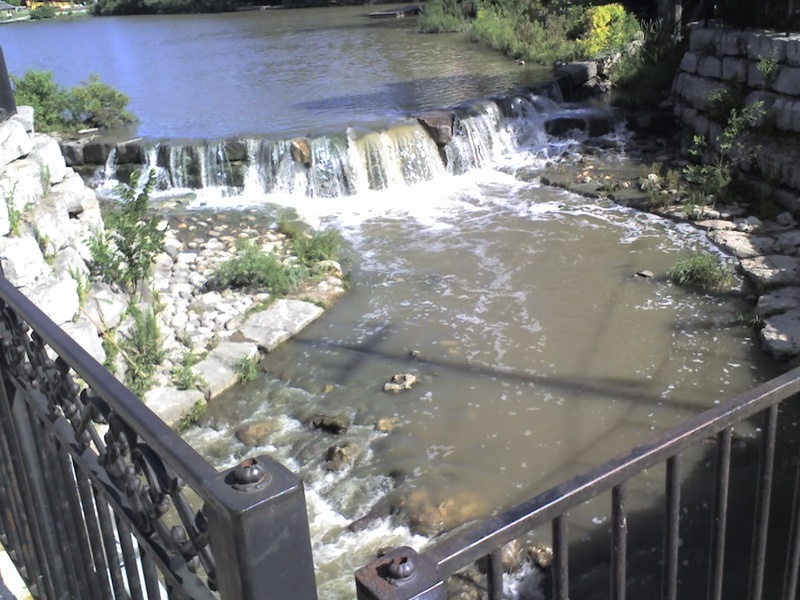 We have had 667.5 mm of precipitation so far in 2008, the average for this time of year is 506.0 mm. Last year at this time we only had 354.5 mm, thus this year we have had almost twice as much precipitation as 2007. Not much to stay temperature-wise about July, it averaged out to 0.7 degrees above average which is just enough to call it an above average month. Just like June the daily low temperatures were very much above average while the daily high temperatures were actually slightly below average. Thanks to Prof. Bryan Tolson for getting me the MTO data.